One of the most underrated Apple II games ever made, Captain Goodnight and the Islands of Fear is a very funny platformer that is both addictive and very frustrating due to the high difficulty level. The plot goes as follows: from the insideous Dr. Maybe's remote Fear Islands headquarters comes an ultimatum: "Deliver $200 billion in gold to my agents in 24 hours or face worldwide destruction." Your mission, as the redoubtable Captain Goodnight, is to outfight Dr. Maybe's mechanized minions and destroy the Doomsday Device. 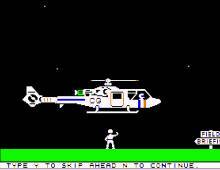 Thus begins a very funny James Bond spoof and one of the most memorable games on the Apple II. A clever combination of earlier arcade hits, Captain Goodnight features cleverly merged, expertly executed air, land, and sea action scenarios. In addition to walking, you will fly in a plane, control a submarine, ride a boat, board a tram or teleportal, pilot a helicopter, and even ride a jeep or a tank. The graphics are excellent by 1985 standards, and the gameplay has a lot of realistic details. You can duck and fire while walking, and must slow to a stop when running as in real life. When you pilot a plane, you can increase the speed and fire missiles at ground targets. The extensive variety of gameplay in Captain Goodnight gives the game a much bigger “bang for the buck” than most of its contemporaries. As if good gameplay variety isn’t enough, Captain Goodnight has a great sense of humor that makes it even more enjoyable. As you blast away at enemy radar and planes and shoot robots, the game gives a running commentary at the bottom of the screen. “Curse you, Goodnight!,” says the first robot you killed; “Have a ‘pineapple,’ Goodnight!,” yells another robot as he lobs a grenade; and “Here's looking at you, Goodnight!,” yells an overhead scout robot as he guns you down. This adds a lot of great comic-book atmosphere to the game and a lot of memorable sarcastic one-liners. As good as it is, the game is not perfect. The most infuriating thing is that you will get killed A LOT. There’s a pretty tough time limit too – it starts at 100 hours and ticks off one minute per second in real time, with a one-hour penalty if you get killed. Worse yet, each defeat sets you back to the beginning of the current scenario, costing precious minutes. There are also occasional “scripted defeat” in the game – probably to show off one of several rescue sequences. Fortunately, once you figure out the best strategy to defeat the enemies (for me, it’s the crouch-and-fire method), you can use it confidently on higher levels. Playing Captain Goodnight is one of my fondest memories on the Apple II. If you don’t mind dying a lot, this is a great game for many stimulating replays, although it’s a pity that all the encounters (except the Doomsday machine sequence) are fixed so you’ll know where the enemies will come from the second time. Two thumbs up, and a definite entry into the Hall of Belated Fame for this classic that I spent countless hours with as a kid.